For stitchers who find it difficult to get their thread into the tiny eye of the needle, there are solutions to this difficulty! 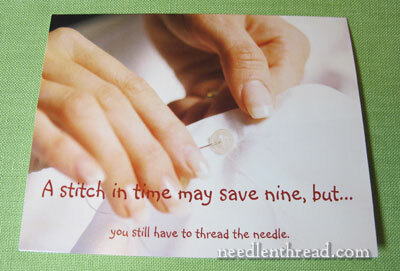 If you have a hard time threading your needles, don’t let this prevent you from indulging in embroidery. The trick is to find a solution that works for you and helps you overcome the difficulty once and for all. When it comes to tools to help you thread your needles, there are plenty of different needle threaders available on the market. But sometimes, keeping track of another little tool – and one that can be awkward to use – may not be your idea of an ideal solution. So here’s another option – the Spiral Eye Needle. When you order Spiral Eye Needles, they come with this little card. I think it’s hilarious – and so very true! Spiral Eye needles are side threading needles that offer a no-fail, quick solution for threading your needle. The needles are specially designed so that your embroidery thread can slip right into the side of the eye. The “spiral” in the eye keeps the thread from moving back out the side slot. 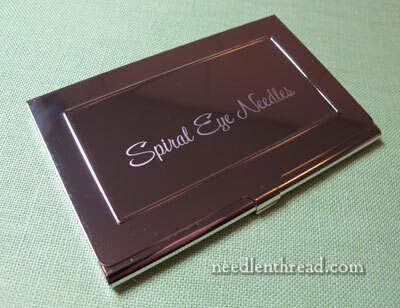 I reviewed the Spiral Eye Needle years ago, and since then, the needles have gotten better and better. The ones I have now are very strong, perfectly smooth and round, clean of burrs or any imperfections that can cause thread frustrations. They slip in and out of the fabric just as easily as any good needle – but they are a whole lot easier to thread! It takes about a split second to get the thread into the eye of this needle. You simply fold your thread over the shaft of the needle and slide it upwards towards the eye and into the slot – and bingo! The thread is in! When I first came across Spiral Eye needles, there were only a couple sizes available. Since then, the selection has expanded. They now make needles for hand sewing (similar to your basic sharp), they make Chenille needles in various sizes for crewel work and other embroider endeavors, and they also make tapestry needles in a whole variety of sizes. For machine sewers, they also make a side threading needle for sewing machines that is apparently quite good. I have one, but I haven’t tried it yet because my machine is on the fritz. I’d love to hear your opinion, if you’ve tried the Spiral Eye machine needle. … into which you can slide several packs of Spiral Eye needles. Handy! I think the Spiral Eye needle is especially worth investing in, if you have difficulties with your eyesight. Sometimes, when we’re not quite seeing so well, threading a needle can be so frustrating that it becomes a complete turn-off to hand embroidery. I like products that solve problems for embroiderers, and keep them embroidering longer. The Spiral Eye needle is just such a product! It’s true that the needles are an investment – they’re admittedly more expensive than regular embroidery or sewing needles. They are made in the US, in small batches with close quality control standards. You can find Spiral Eye needles straight through the Spiral Eye Needle Company, where domestic shipping happens to be free right now, through the end of March. You can also find them through various locally owned needlework and quilt shops around the country. If you’re a shop owner and want to carry them, you can contact Pam Turner at Spiral Eye Needles. To me, they are a special service item that demonstrates to customers that their local shop owners are looking out for their customers’ needs, especially for needleworkers whose eyesight might not be quite what it used to be. Hobby Lobby also carries Spiral Eye Needles in their needle arts department, if you happen to have a Hobby Lobby close by. 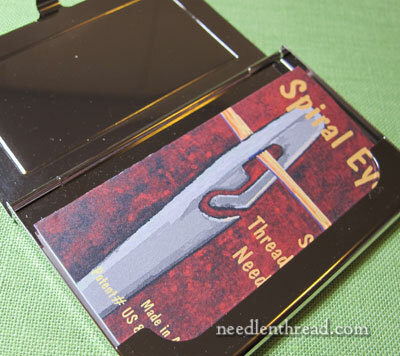 So, if threading your needle has become an onerous task that prevents you from indulging in needlework, consider investing in Spiral Eye needles. They’ll make needle-threading a breeze and, hopefully, they’ll eliminate a pile of frustration for you! There’s no affiliation here between me and Spiral Eye needles. I just think they’re worth knowing about, for those who need them! March 21, 2018 Have You Tried Tulip Needles for Embroidery? First time I’ve heard of these needles. I’ll definitely be looking them up. Thanks for the ‘spiral’ on them. What size of these needles would compare with a hemmings embroidery # 9 or 10? The website isn’t working right for me and I cannot quite tell. 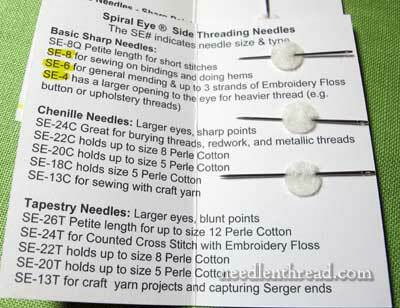 Hi, Anne – the smallest needle is the SE-8, which I think would work. There’s a section at the end of this page: http://www.spiraleyeneedles.com/Needles.html in yellow, with explanations and comparisons. 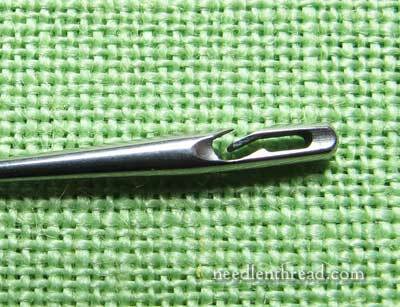 These are not only for those who have trouble threading needles – I’ve seen tips to use them as thread tail pullers. Insert the needle under the other stitches, put your thread tail in the eye and pull through. Even if you have offical thread tail tools, these might be just the thing while traveling. I’ve done similar with regular needles, but these would make the task so much easier. It might even make getting that 1 last stitch worth it. I might even shoot for 2 last stitches 🙂 . Thanks for this helpful tip. I’m one of those gotta get the last stitch people. Thanks for informing us of these useful needles. Yes I’m at that stage where I can’t see the eye of the needles any more need close work classes and magnifier, getting old! they look good will have to research them, just one question what are they to stitch with? Interesting!! Looks interesting, but I really prefer my LoRan needle threader, using whatever needles I prefer. I’ve use this brand needle threader for years; inexpensive and works perfectly for embroidery threads and tapestry needles. I originally bought a few, tied a couple with pretty strands of floss right onto my scissors, keep the rest in my stitching basket. Even as my eyes have changed, I can still thread without any problem. I also keep a little wire threader in my box for fine hand sewing. Thanks Mary for the info I just placed an order. After using the computer at work all day I find it sometimes to hard to focus to thread a needle. Well, I’m not there yet, but I’ve had to change from squinting thru the right eye to squinting thru the left, so . . . thanks for the source. Thank you so much for this posting. I’ve thought about trying those, but I’ve been trying to stick with higher quality needles. They are easier to work with. However, my eyes are getting worse and I need a needle threader all the time. I’m anxious to try these. No sabia que existían esas agujas ,gracias,voy a iniciar una investigación para encontrarla donde vivo ,en América del Sur.Cariños.Seria un regalo increíble para mi madre y para mi también. I love the Red butterfly. It looks so cheerful. Oh my gosh! Never heard of these before. Come to mamma, you beauties! I am waiting for a Spiral Eye Needle for beading. The tiny little holes are the most frustrating needles to try and get a thread through . . . and then it comes unthreaded during use. Ahh! I got my first ones through a Publishers Clearing House and loved them. Then they vanished, after someone used my supplies (probably mis-filed), & want more, especially for the sewing machine. I can thread most needles if I take off my glasses (very myopic, & now need bifocals), but the sewing machine stymies me. I ordered some of these needles right away as it sometimes takes me longer to thread the needle than it does to sew the seam! I do like them, but my thread does slip out of them while I am working. Luckily, they are easy to rethread…. Previous Previous post: Trish Burr Butterflies! A Give-Away!